Inventory is now a breeze with our softwares' One-day Inventory feature. Scan ISBNs for instant (qLOC) catalog data entry. Works in your web browser. Great for searching Library of Congress, Amazon.com sites. Easy to install. Plug scanner into a USB port. You're done! ** When using these codes it is possible to check out several patrons with multiple items using only the scanner, never touching the keyboard or mouse. 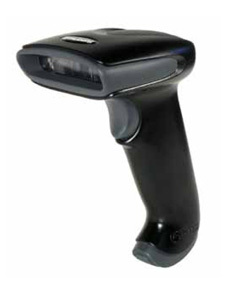 The 1300g is a high performance, hand-held bar code scanner. Using unique, linear imaging technology, it combines a bright, sharp aiming line with high resolution imaging to deliver exceptional performance. The 1300g handle is a smoothly contoured grip area with a precise "pistol-type" trigger. Its rugged construction and advanced scan/read design make it an ideal choice for the active library. An add-on stand is available to permit hands-free operation.